People really like to take home souvenirs of themselves. Photo booth pictures are the ultimate Christmas party favor. People put them on their refrigerator or on their office wall and literally keep them there for many years – creating a lasting connection to the memories of a fantastic day. Our state-of-the-art, open air concept booth. Unlimited photos. Each photo session prints as either one 4×6 print or two 2×6 photo strips. Choice of a backdrop including a green screen which allows the booth to use any image as the photo backdrop. This allows your guests to have their photo taken virtually anywhere. Great looking photos every time with studio grade lighting built into the booth. A large touch screen enables guests to see themselves pose and allows them to stage great pictures. Ideal keepsakes for each one of your guests: a top quality photo strip or group of photographs printed in post card style of each person having a great time. These lab quality photos print in less than 10 seconds, are smudge proof, and should last a hundred years. 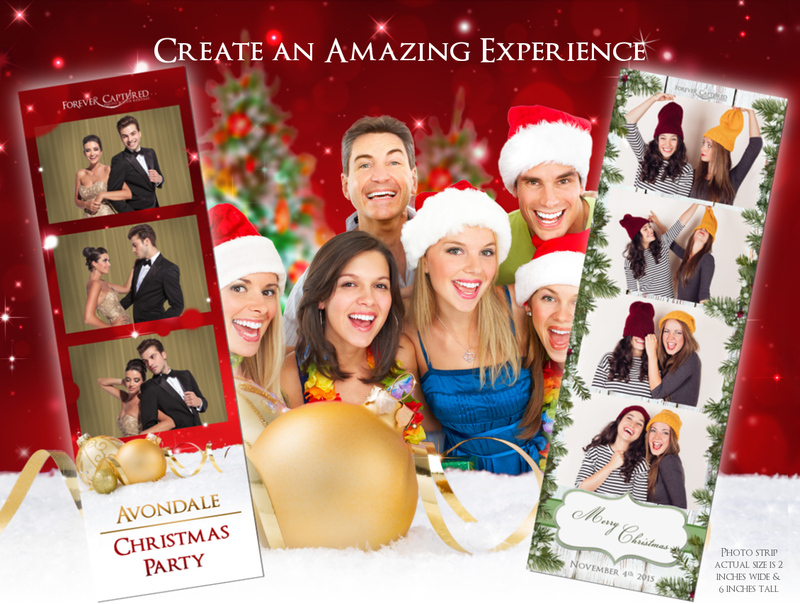 We always customize the photo layout and design for all Christmas parties we’re a part of. You can add special graphics, your Christmas party’s name, company logo, or a special message. Click here to see the different photo booth print layouts you can choose from when you rent from us. Our photo layouts are among the finest offered in North America. Those attending your event can share their photos with friends – and each other – on Facebook, Twitter, Pinterest, or through email – all from our photo booth sharing kiosk. A wide selection of interesting and really fun props for guests to choose from our Deluxe Prop Box. A friendly, well trained photo booth attendant who will remain on-site for the full length of your Christmas party. There are a lot of other extras we work in to your package too. Feel free to tell us about any idea you are thinking about. So if you’re contemplating a photo booth rental for your Christmas or holiday party or event, Forever Captured PhotoBooth is here to help you create a fantastic experience for your guests that they will thoroughly enjoy and remember for many years to come. Contact us today, and we can start talking about what you have in mind for your party or event. Contact us at info@forevercaptured.ca or at .